One of the nicest features of this CX-9 is that it is 15 days from the scheduled date; the car, from 15 days prior (on startup), reminds the driver that the scheduled day is coming up. I finally made my appointment to have the car serviced at Mazda Greenhills after the daily reminders from the car’s information cluster. I was greeted by Mr. Bong Pretosa, a very affable and professional service advisor. He immediately explained what services needed to be done on the car: Oil change, replacing the engine oil filter, inspecting belts, fluid levels, etc. One thing that got my attention was, although rather small, was the waiting area for owners. It was well stocked with magazines, newspapers, and a large-screen television. Coffee was readily poured, not the 3-in-1 instant variety. We are talking brewed barako coffee. After filling out the service contract, I then proceeded to the showroom area inspecting the latest MX-5, while waiting for the RF (more on this later). I like being spoiled by service centers and Mazda does it right. When I picked up the CX-9, my car was prepped and cleaned. They even placed plastic on the steering wheel! Bong then proceeded to explain to me every detail about the service done and even went through all the fluid levels (water, brake, oil, etc.) with me to show they were indeed full. One of my biggest complaints is that in every car dealership I’ve been to, the wait to release a car has always been excruciatingly long. This time, everything was ready and prepared for me. I was in and out within 20 minutes. 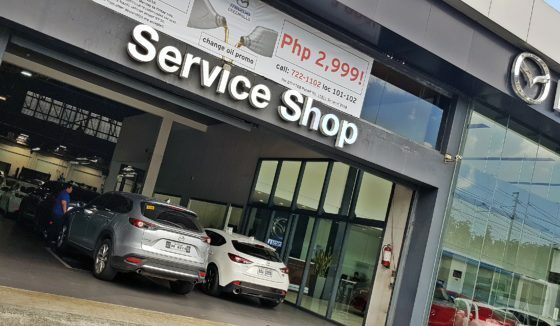 This has been my usual experience with my Mazda 6 and Mazda Greenhills. It’s a first-rate dealership. This is another reason why buying a Mazda is a good deal. Obviously, the question is how the car was when I drove it out of the dealership. Well, in a word: great. 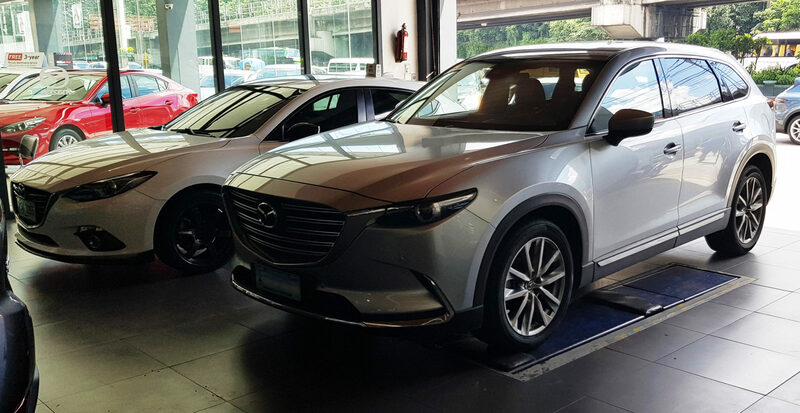 There was a new-car feeling to the CX-9 and a sense of real comfort that everything was inspected and tuned. They give your car TLC. After more than 6 months of driving (almost) perfection, Mazda Philippines decides to throw me a fabulous curveball … a 2018 MX-5 RF! I’ve been a grandfather for too long that Mazda said, “… let’s get your soul pumping again”. I was asked to review and use this Dark Anthracite RF while the CX-9 was being serviced. Duh … how could I even say, “… let me think about it”? OK, I have had the pleasure of driving the remarkable MX-5 Roadster early this year so I knew what to expect: a perfectly balanced, quick, precise, fun, fun, fun driving machine. (Did I mention “fun”?) Looking at the RF, I realized that the lines were rather smooth in its “hardtop” version. OK, it looks like it is an original design … like it was initially drawn as a Targa top. Still, I love the downhome look and proper design of the soft top. The RF is a little more expensive … the motorized Targa top costs more than the manually operated soft top. Getting inside the RF, I noticed that there is NO difference between the 2 variants. Everything is properly placed and spaced. Switches, knobs, pedals (slightly offset to the right), etc. are all where they should be. The gearlever is just in the right place, but, gasp! … It’s not a manual!!! (I am an avid fan of this type of machine being ONLY in manual!) After familiarizing myself with all the bells and whistles, I step on the brake, press the “On/Off” Start button, and immediately hear the wonderful roar of the engine. Mind you, it can never have a roar like an American muscle V8 Mustang, Camaro or even have a Porsche, Ferrari whine. This is after all a 2.0-liter, normally aspirated 181hp engine. OK, the RF is a small car. Anyone over 6-feet tall and of larger girth may have difficulty finding this car comfortable. Yet, driving position IS very good. I do complain that there is not a lot of storage space. Plus, one cannot fit a golf bag in the smallish trunk. I decided to take the car to Tagaytay to stretch its wings. First thing I noticed about this car is that its feel is slightly stiffer than that of the roadster. Its suspension is tuned on the softer side, absorbing potholes and the normally uneven roads of Metro Manila. Yet, transmission of road surface to driver and passenger is very encouraging. Handling the RF through the Carmona bypass road to Riviera is a reassuring drive. The RF provides lots of grip so I could really put the car through its paces without any panic. This is a playful car, alluding to its rear-wheel drive layout. Power from this naturally aspirated engine is just right but to get the most from this car, I needed to rev the RF through its gears. Sometimes though, I felt gear changes happened a little long before going to its 7500rpm redline. Still, even though gear changes are comfortable, how I longed for a MANUAL box! You just cannot be as engaged with an automatic setup as you would be with a manual box … period. The real beauty of this car is that when we arrived in Tagaytay, I operated the super simple Targa top mechanism (all 15 seconds long) and took in the cool Tagaytay air for some open-top motoring. This is why one will buy an MX-5. This is driving heaven! OK, you need to be thick-faced because it does attract so much attention from the public … people gawking constantly, no matter how many MX-5s are already on the road. This is a handsome car, after all. Now, the question is – soft-top or Targa. Frankly, the preference is all up to you. Both cars offer their drivers honest, pure, sharp, precise, driving pleasures. Every time you exit the MX-5, you have this satisfied look in your face. “Where have you been all my life?” I personally like the ragtop … something very nostalgic about its design and appeal. The soft top begs for a British Racing Green with tan leather interior variant to give you the ENTIRE (vintage) sports car experience. My personal feeling is that the RF just looks too modern; too now. Yet, if I were given one … I wouldn’t throw it away … EVER! The bottom line is this: every home should have an MX-5 (either a soft-top or RF) in their garage.